This fresh and spicy dish from Regina Schrambling was first published July 28, 2004. 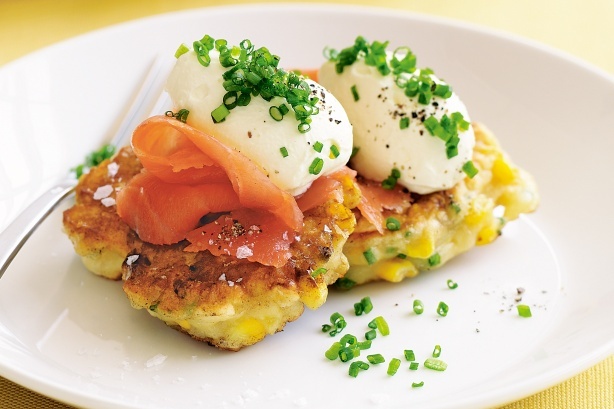 It makes a wonderful summer supper or weekend brunch dish and, if the corn cakes are made silver-dollar sized, works as an appetizer, too. Note: Smoked trout or shrimp can substitute for the salmon. 1. Steam the corn until tender, about 5 minutes. Cool, then slice off the kernels. Place in a mixing bowl and add the cornmeal, flour, sugar, salt, baking soda, green onions and jalapeno. 2. In a separate bowl, whisk together the egg, milk and melted butter. Pour the egg mixture into the dry ingredients and mix well. 4. To serve, lay 2 pancakes on each serving plate. Spoon a little creme fraiche on the center of each pancake and top with some cilantro. Divide the strips of salmon among the pancakes on top of the cilantro. Serve immediately.